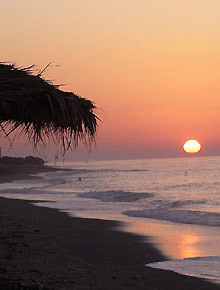 Kamari is a cosmopolitan beach resort that has been awarded the Blue Flag. 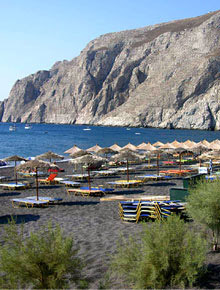 The long stretch of beach lies under the impressive mountain of Mesa Vouno and the settlement of Ancient Thira. The water is deep and blue, the sand is black and there is a lifeguard on duty. There is a long paved promenade for strolling that runs parallel to the beach right across the bay. This is closed off to traffic during the summer months. Kamari offers a wealth of cafes, bars, restaurants, shops and supermarkets, as well as a lively nightlife. 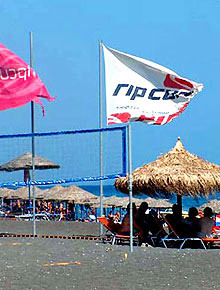 The beach is organized, with sunbeds, umbrellas, water sports and diving. Kamari Beach has received the exclusive eco-label BLUE FLAG AWARD. This area offers is the longest stretch of beach on the island. There are no boundaries or markers to distinguish where one beach finishes and the other starts. The beaches are very popular, with a sandy sea bottom for the most part, although here and there one will find pebbles and submerged rock. Perissa beach has been awarded the coveted Blue Flag and has 2 diving centers. Both Perissa and Perivolos are well organized with life guards, sunbeds, umbrellas, restaurants, taverns, cafes, bars, supermarkets, showers, public toilets and a playground. Perivolos in particular is a more up-market clubbing scene, an extension of Santorini’s nightlife by day, with beach bars playing club music, DJ guest appearances, volley ball tournaments and special events. There are lots of water sports to choose from such as jet ski, parasailing, wind surfing etc. Perissa Beach has received the exclusive eco-label BLUE FLAG AWARD.